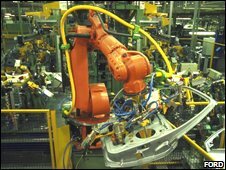 US manufacturing activity fell in October to its lowest level for 26 years, according to a new report from the Institute for Supply Management. The report cited "significant demand destruction", for the third consecutive month in which the sector contracted. The figures were far worse than the market had expected and pushed the Dow Jones index briefly into negative territory in early morning trading. However, US construction spending in September fell far less than expected. The institute's index of national factory activity fell to 38.9 from 43.5 in September. Any score of less than 50 represents a contraction in manufacturing. October's score is the lowest-recorded since September 1982. Every sector surveyed, apart from clothing and electronic products, reported a contraction for the month. New orders, production, employment and supplier deliveries all fell, with only inventories of unsold goods increasing on September's score. Export orders fell for the first time following 70 consecutive months of growth. Robert Macintosh, chief economist at Eaton Vance, described the figures as "pretty grim". "It means we're in a recession, it's as simple as that - a pretty solid manufacturing recession," he said. There was some good news for consumers, however, as prices fell by 16.5 points to 37, the lowest level since December 2001. If the prices of raw materials are falling, then these savings can be passed on to consumers. There was more bad news for US manufacturing with the release of October car sales figures. General Motors sales were down 45% compared with October 2007. "This is clearly a severe, severe recession for the US automotive industry and something we really can't sustain," said GM's Mike DiGiovanni. Chrysler's sales fell 35% and Ford's dropped 30%. Overall, 838,156 vehicles were sold in October, down 32% and the worst figures since January 1991, according to Autodata. Meanwhile, US construction spending in September fell 0.3%, according to figures released by the US Commerce Department - less than the 0.8% fall that many analysts had been expecting. The US figures were released on the same day that Markit Economics published its Purchasing Managers' Index showing eurozone manufacturing activity falling to 41.1 in October. This is the lowest score recorded by the index since it was introduced 11 years ago.